Work has been slow but steady on our 1930 Ford Model A coupe project. 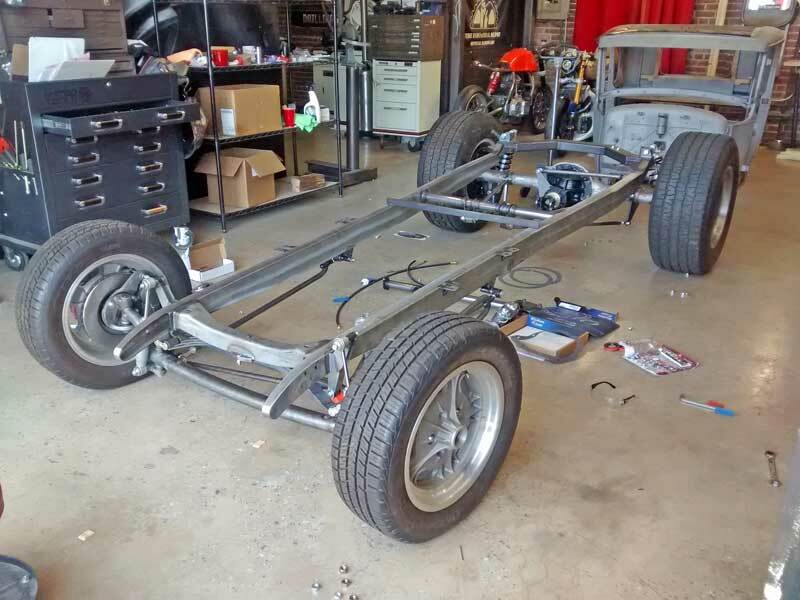 Our first order of business was to remove the body from the chassis. While the body is important, we want this to be a drivable car that can be enjoyed by the owners with minimal fuss. We went over our options with the team at Fuller Moto and they gave us three choices. One option was to keep the chassis as-is and just refresh the existing systems. If we were doing a concours restoration this would have been the appropriate option. Our next option was to keep the existing frame and adapt modern systems to it. 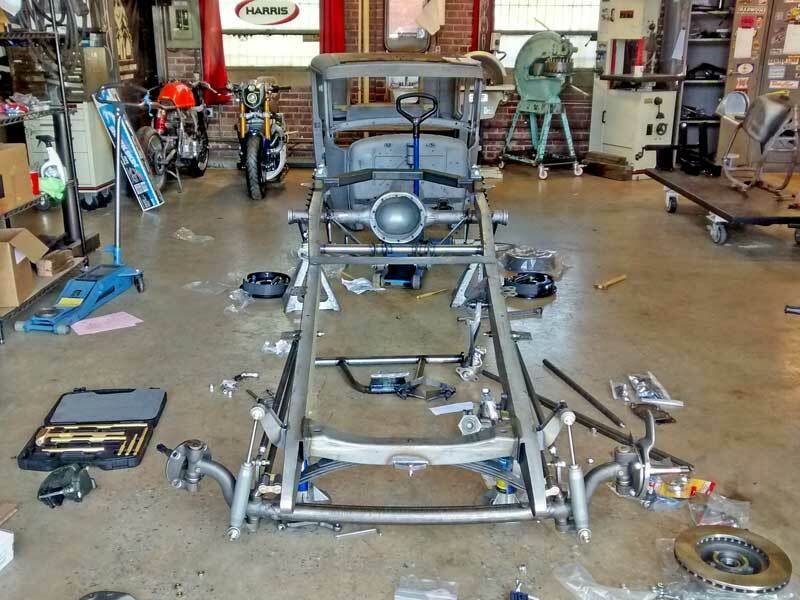 This would allow us to keep the car more original, but would have required a fair amount of modifications to the frame and making the various systems work around the remaining antique components. 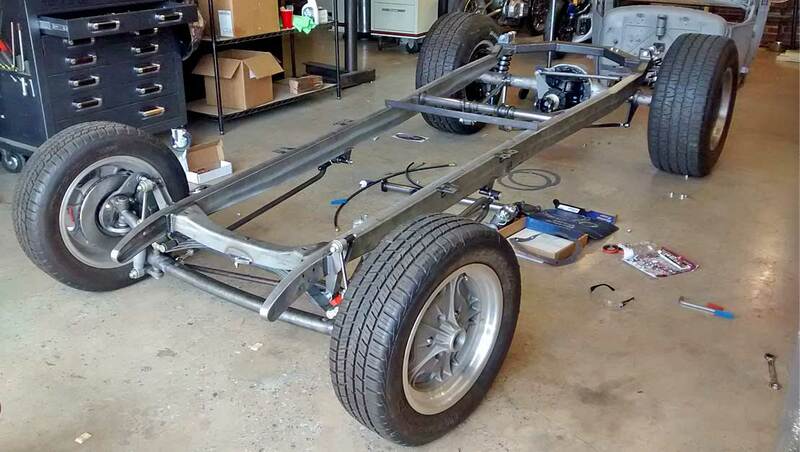 Ultimately we chose the third option: purchase a rolling chassis already prepped for modern components. This is the new foundation for our 1930 Model A project. Some assembly required. We chose to work with Pete & Jake’s Hot Rod Parts of Peculiar, MO to supply us with a mixture of vintage and modern components for our project. 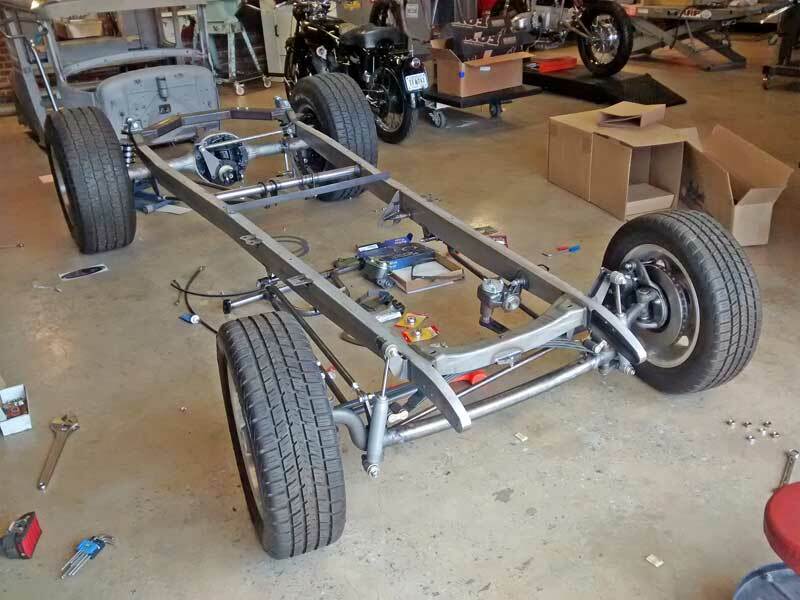 Our frame is fully boxed and welded on a jig to match our existing body mounts. 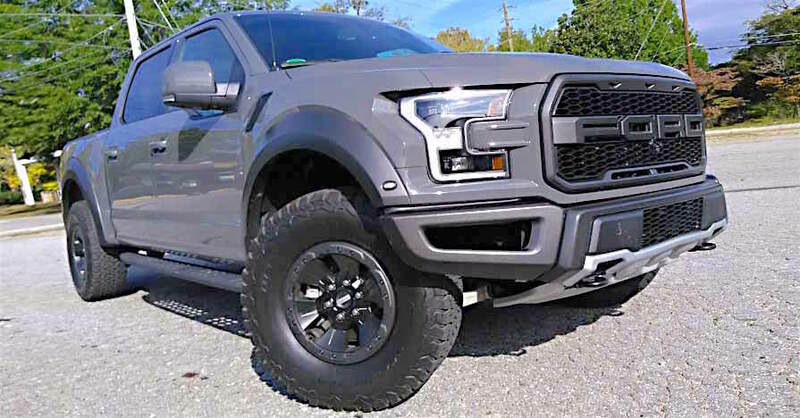 Additionally, we chose to keep the solid front axle design but with a twist: it is now mounted via “hairpin-style” radius rods instead of the stock “wishbone” design. We replaced the original hydraulic shocks with modern, gas filled units that will help soak up any rough roads. This was the original front suspension and steering system. You can see the actuator rod for the mechanical brakes and the steering linkage. It worked, but it was crude. This is the new front suspension. 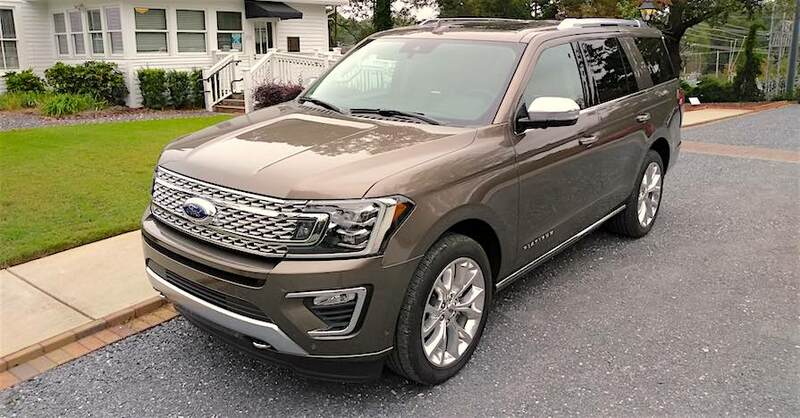 The most obvious changes are the addition of a modern shock absorber and hydraulic disc brakes. The front brakes are common GM units so maintenance parts will be easy to find. This is the updated front suspension and steering system as seen from above. You can see the steering linkage passes through the “hairpin” radius rods. We updated the steering system, too. The relocated, modern steering box and cross-steering linkage will greatly reduce bump-steer, a drawback of the original push/pull design. 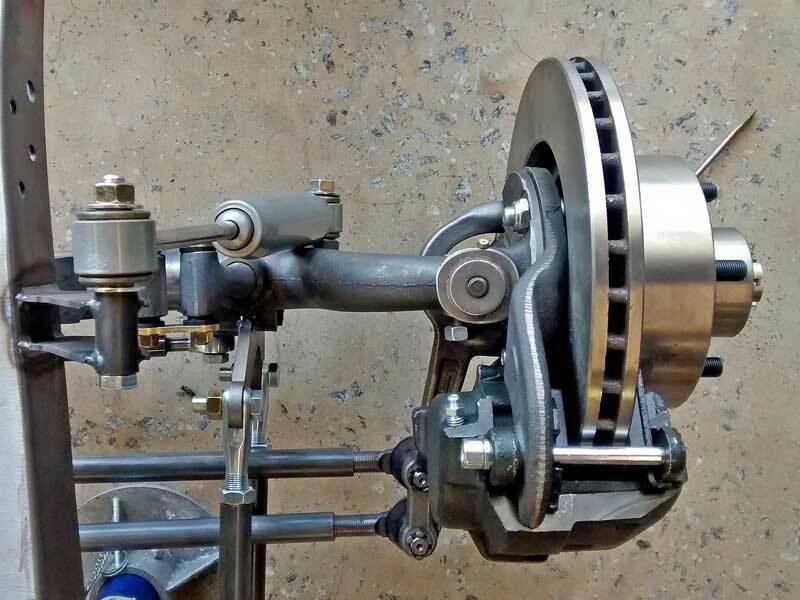 Mounted to our new front axle are hydraulic disc brakes that replace the original mechanically actuated drum brakes. 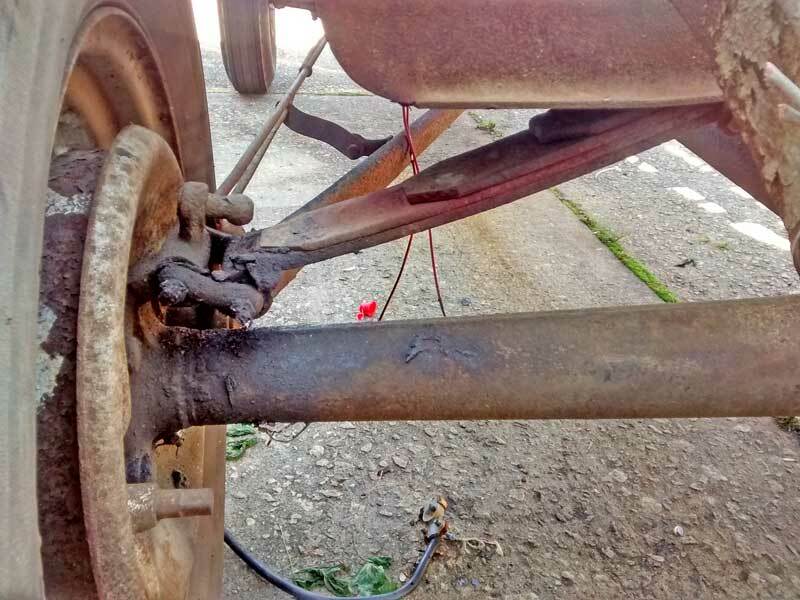 The original mechanical drum brakes were an effective design for the time, but advances in braking technology make a swap to hydraulic brakes a wise decision. To actuate the hydraulic brakes, we opted for a dual circuit master cylinder mounted along the driver side frame rail. This was necessary due to relatively scarce space available on a Model A firewall. 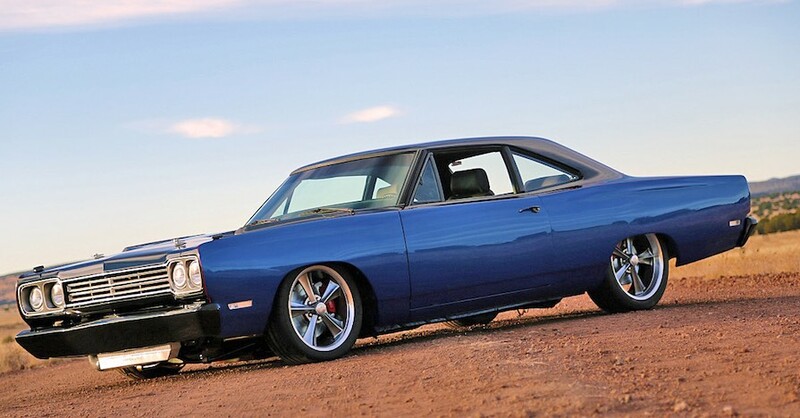 The original rear suspension was not made for today’s roads. The Model A was made to be rugged, not comfortable. 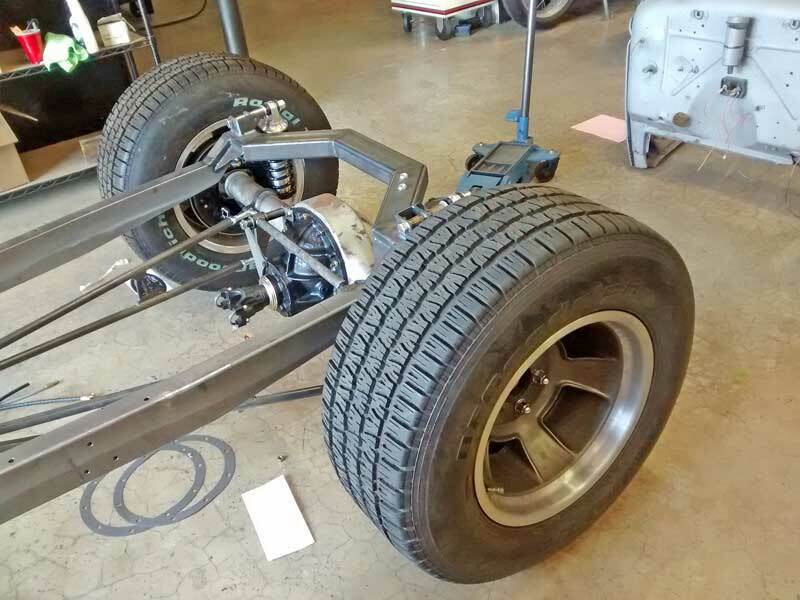 Things are pretty simple, just a leaf spring, an axle, and a mechanical drum brake. The new rear suspension has a few major changes, mainly the coil-over shock that replaces the leaf spring while adding a damper. The axle is fairly standard, as are the hydraulic drum brakes. Moving to the rear a new Ford 9-inch rear axle is mounted to the frame via a ladder bar setup. 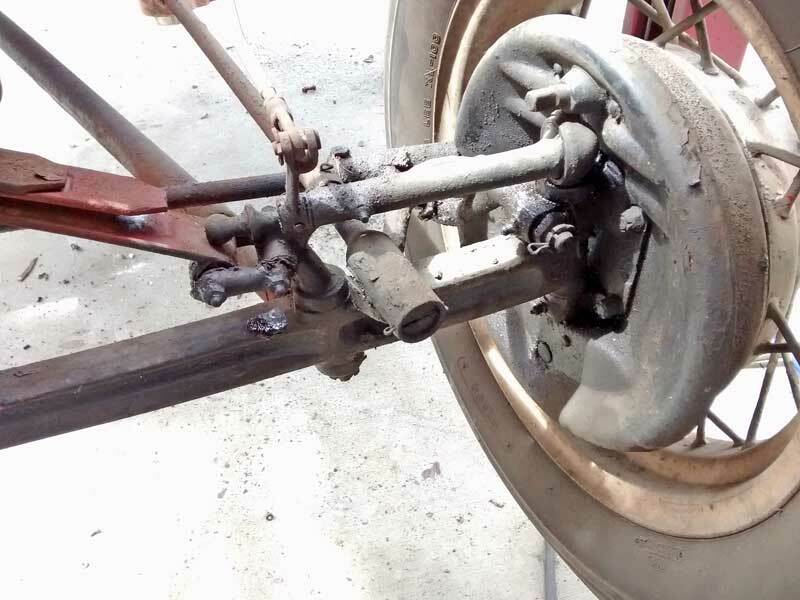 This replaces the original banjo rear axle and torque tube assembly. 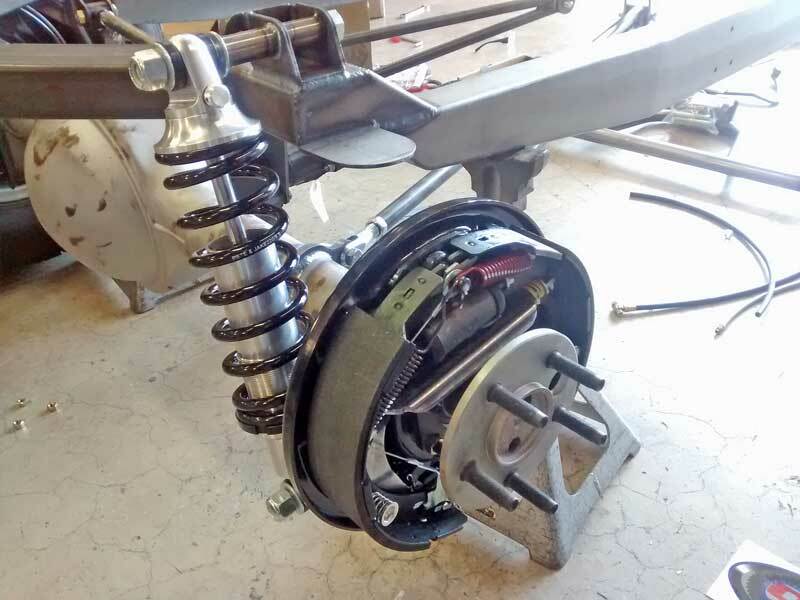 To further simplify the assembly we chose to eliminate the single leaf spring and instead utilize a coil-over shock setup. 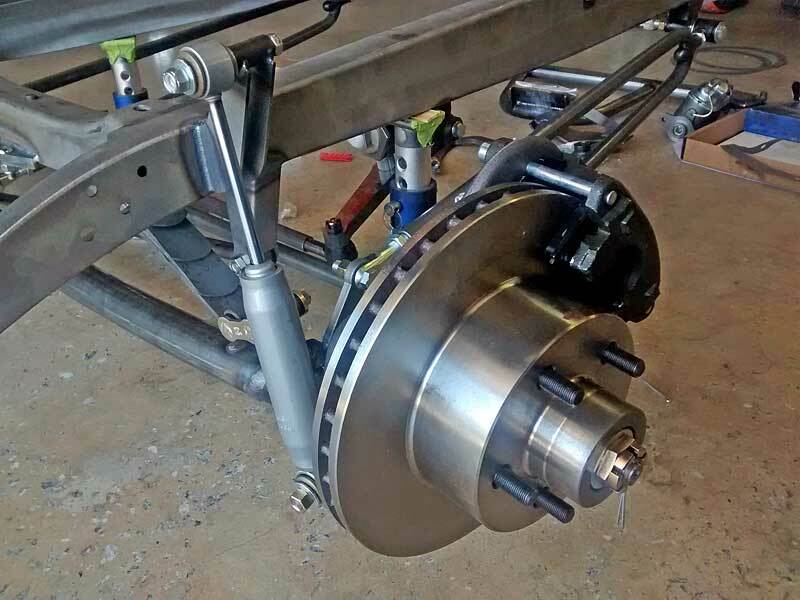 Standard Ford hydraulic 11” drum brakes take care of stopping the rear wheels without looking out of place. And to make the car easy on gas and highway friendly we opted for a 3.00:1 rear axle ratio. Together these updated systems will give the Model A the feel of a car almost half a century its junior. Of course the goal here isn’t a “corner carving” track day terror, but an “easy to drive” classic. We think this package is going to deliver that experience for the young owners. That’s better! 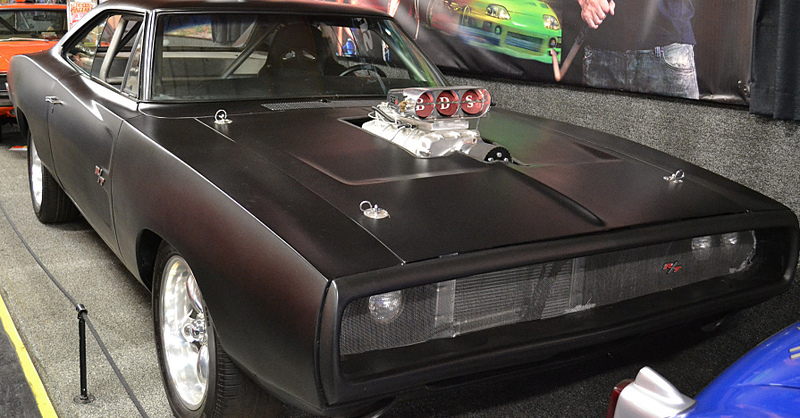 The wheels are temporary and belong on one of Bryan Fuller’s personal cars, but we kind of like the stance. From this angle you can see the nearly complete chassis. We still need to plumb the brakes, but most of the pieces are in place. Nothing crazy here, just some well thought out replacements and upgrades. Synthetic Versus Conventional Oil: Which Should You Use?